PLEASE PARDON OUR DUST. THIS PAGE IS UNDER CONSTRUCTION! Each season, Songs at The Center augments our “in-the-round” format with episodes that feature one-on-one interviews with songwriters who have been recognized for their elite achievements. We’re proud to welcome our “Master Series” artists to discuss the songwriting craft. John Oates is one half of the bestselling duo of all time, Hall & Oates. In addition to their numerous American Music, MTV awards, and multiple Grammy nominations, they were inducted into the American Songwriters Hall of Fame in 2005, and in 2008 were presented the prestigious BMI Icon Award for their outstanding career achievement in songwriting. In April 2014 Hall & Oates were inducted into the Rock and Roll Hall of Fame. 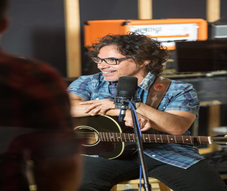 Since embarking on a long awaited solo career in 1999, John has recorded five solo albums including Phunk Shui, 1000 Miles of Life, Mississippi Mile, a live album called The Bluesville Sessions, and most recently Good Road To Follow, which features collaborations with Ryan Tedder of OneRepublic, Vince Gill, Nathan Chapman, Jim Lauderdale, and more. 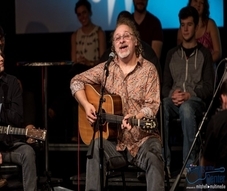 John is a diverse musician and songwriter active in the Nashville community and beyond. Don Henry is best known for his Grammy Award winning song, “Where’ve You Been,” recorded by Kathy Mattea, and co- written with Jon Vezner. He has had songs recorded by Ray Charles, Blake Shelton, Miranda Lambert, BJ Thomas, Patti Page, Conway Twitty, among others. The wit and wisdom of Don’s songs are widely celebrated. “Where’ve You Been” also garnered Song of the Year honors from the Academy of Country Music, the Country Music Association, and Nashville Songwriters Association International. “Where’ve You Been” was the first song in country music history to be awarded all four honors in the same year. 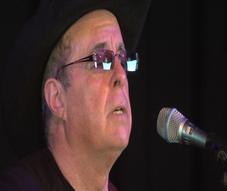 Tom Russell: is one of America’s foremost songwriters, having been recorded by Johnny Cash, Jerry Jeff Walker, Joe Ely, Nanci Griffith, Iris Dement, and Ramblin’ Jack Elliott, among others. Legendary poet, Lawrence Ferlinghetti, said that Tom “is writing out of the wounded heart of America.” Tom made five appearances on The Late Show with David Letterman, and his songs have served as soundtracks in multiple movies and television series. He is also an author and painter.